To own a place in Los Angeles is almost impossible, unless you have a couple million in the bank. Rents are steadily increasing, and Santa Monica now boasts a one bedroom with no views for around $3500 a month. LA Weekly reported that you can find a two bedroom for $5000 in Venice, and currently the median rent for a one-bedroom apartment is the L.A. Metro area is almost $2,000. As the population increases, rents are difficult to find. Los Angeles and its beach areas like Malibu, Santa Monica, and Venice are very desirable places to live, especially since Los Angeles is a dynamic city offering a diverse interesting culture with sunshine almost all yearlong. We are lucky to live across from Billionaire Beach in Malibu with breezes and airy light flowing through our home, ocean views, and thousands of acres, canyons and wildlife in our backyard, but our tiny beach pad that my fiancé refers to as “a large hotel room” is very small. Thankfully it is doable not only because we get along really well, but I am often at events or traveling. 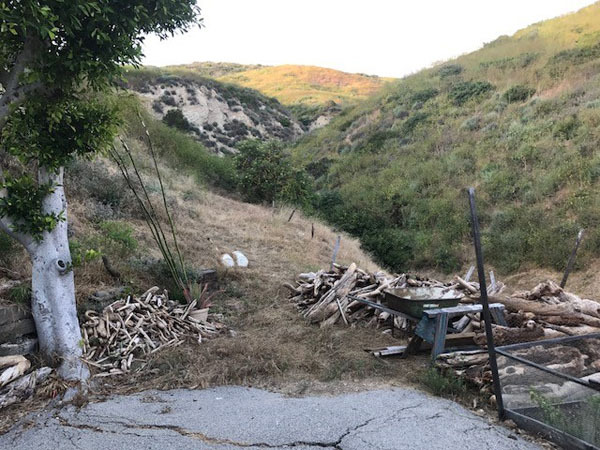 Since I moved in to my boyfriend’s bachelor pad a year ago, I have been dreaming of redoing our backyard space to increase the size of our home. Since it barely ever rains in Los Angeles, this space would be like doubling our home size and adding another area to work, relax, or entertain friends. 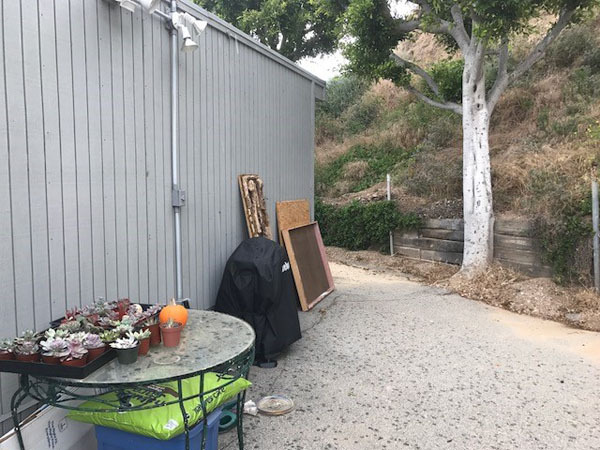 In the last year this backyard area has started to turn into the neighbor’s junkyard storage space where items are left that people have no room for, from trays of succulents to rusted tables and garden tools. Not good energy! When offered the chance to be paired with DIY professional to help me turn this into a livable space, I jumped at the opportunity. Justin DiPego (www.DoitWithJustin.com), Maker of All Things, can basically make anything from nothing. 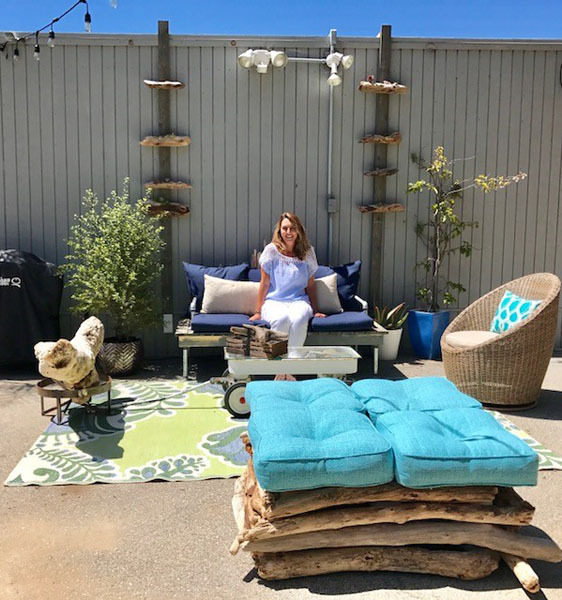 Our hunt for finding unique items to up-cycle or refinish began at Restore, a store that offers used goods and furniture for next to nothing with proceeds benefitting Habitat for Humanity. We looked for old doors to possibly turn into a table or bar, or other interesting finds to make a daybed. 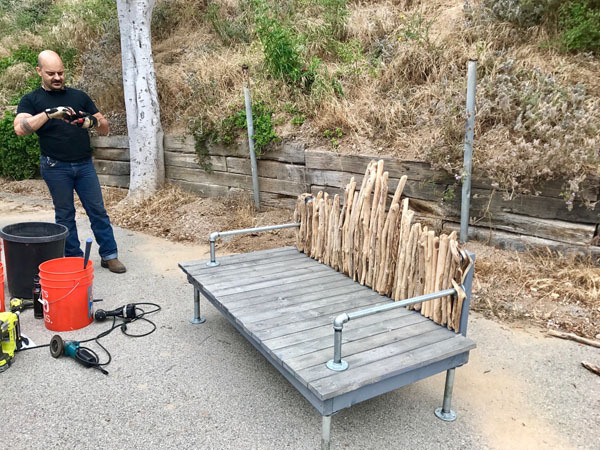 After checking out several other places too, we decided to buy wood and metal pipes from Home Depot to make a lounge bench as a focal point for the space. After clearing out most of the junk and rearranging some plants, we set to work with Justin’s electric table saw, cutting, screwing, and painting. 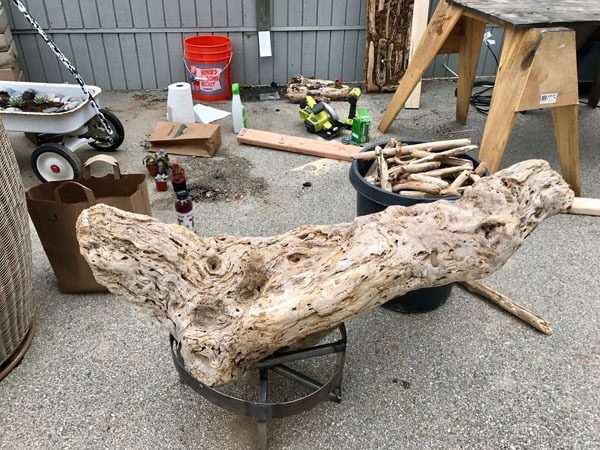 Justin finished off the bench with driftwood that neighbors collected from the beach storms to accent the back of the bench, almost like a mini Game of Thrones chair with poking driftwood pieces for the back. For a day Justin and I fondly looked at this piece of driftwood (that had come from the canyons to the ocean) because it looked like a seat, so by day two, Justin, to my surprise, welded a metal stand to turn the wood into an artistic looking seat that matched the environment beautifully. Besides the guidance of Justin, I had the help of a 2017 GMC Canyon Denali pickup truck. Boy, did I feel like a tough girl! 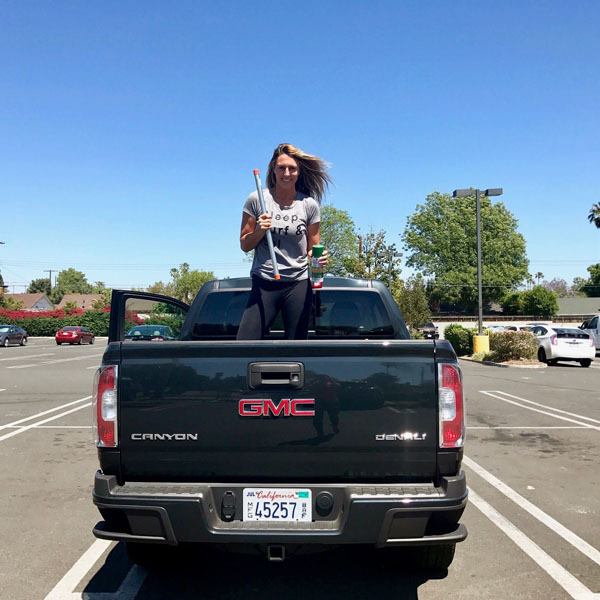 At first, I was a bit scared to drive such a big truck, but soon I realized how easy it was to maneuver the winding canyons from Malibu to the valley, even with wood planks, a new chair (taped down), tall plants, big plant pots, and tools. The truck also had room for two people in the back (or for all the cushions I bought) and was easy to load with one quick click to pop down the back hatch. The best was blaring the Chill station with Sirius radio and the easy pairing capability the truck provided with my iPhone. As soon as I plugged in my iPhone, I could make calls, voice text, and even pair my music mixes from Spotify easily with the color touch screen thanks to Apple CarPlay. For Android users, there is a convenient lay down charger right in the console. Also, through the MyGMC mobile app, the in-car available 4G LTE data service allows you to work on your laptop from anywhere and offers a Wi-Fi hotspot for connectivity in the car for up to seven devices. Amazing, especially once when my cell died and I needed GPS to get me home. First, I looked at whatever junk was around that could be salvaged or what parts of the environment I could use. My neighbor Dion Antic, who owns Beverly Hills Poke and is a skilled designer (from cars, homes, and restaurants) pitched in to help me hang café lights from the trees to the top of the garage. Dion came up with the idea to use the leftover grey wood boards from the bench by hanging them with L-shaped brackets off the roof. He then screwed already-made succulent arrangements in beach wood on to the boards. This added an artsy decorator look to the back wall (since we weren’t allowed to screw into the garage). Our neighbor Brad had created hundreds of these succulent arrangements for living walls, so we used some of his pieces that were being stored behind our home. An old rusty white flyer wagon almost hit the trash, but instead I turned it into a small movable end table. Instead of painting it, I left it in its natural paint pealing state, and filled it with beach rocks, shells, and covered it with a $30 piece of cut glass from Malibu Glass. Instead of tossing this old rusty green circular table with a glass top, I spray painted it matte white and cleaned the brown filthy glass. I found 3 leftover white vases in various sizes from dead orchid purchases and repotted them with different succulents to place on the glass table. Two wicker white chairs came from my mini storage that were just collecting space, and the other 2 wicker chairs we bought at Restore for around $30 total. Dion also brought over two shipping pallets (free) that we stuck on top of one another to create a communal bench. Four aqua soft cushions I found at Home Goods ($60) were added to the top, and driftwood was nailed around the base of the pallets to give the square seat more of a beach-y feel. Numerous plants (lemon tree, plumeria, eucalyptus, palms, bourgonvilla) were bought from Home Depot to place in front of the wired-in garden to make it look more lush, and I repotted several plants that I revived from the backyard too. I spray painted several containers blue, and also bought a few pots from Home Goods for $15-$30. The biggest purchase was a $90 swivel rattan chair with cushion from Home Goods, along with a $25 navy and white puff seat that can also be used to put up your feet. 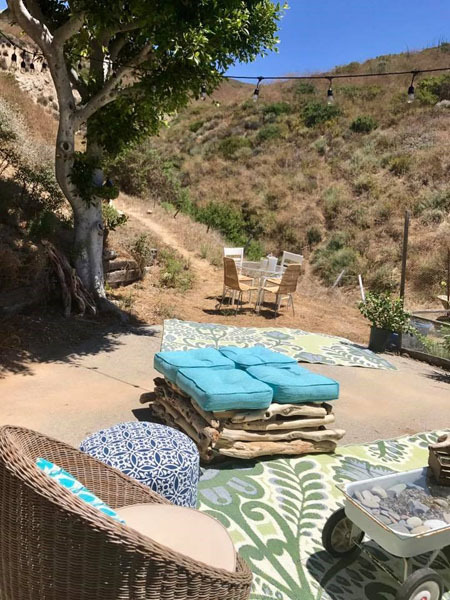 From World Market I scored outdoor rugs for 50% off for less than $30 each, along with navy and gold cushions for $15-$20 each. It is better to buy these towards the end of summer when they go on sale for close to $7. 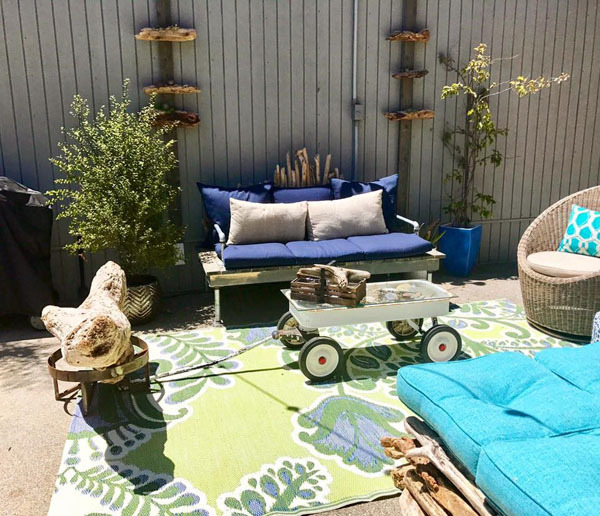 Since our mini backyard transformation, we still have many ideas to put into action. It truly is a work in progress. 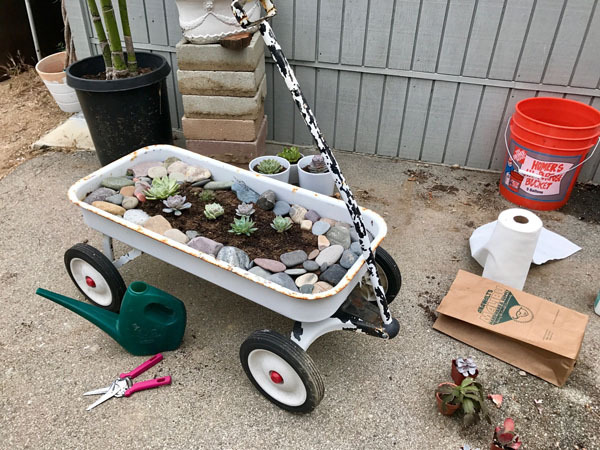 We are looking for a vintage roll cart bar and plan to hang a frame between the succulents. But. This new outdoor space has enabled my fiancé to hold outdoor meetings, and work outside on conference calls. Our neighbors enjoy coming up to relax. As a writer, I have spent days writing with deer, humming birds, and colorful birds surrounding me while I work. Nothing beats an outdoor living space, for work or play!